After being sidelined for more than a month with an illness... I've gotten back to this mission. Just a refresher - Mission: Game Over is my quest to complete We Cheer by the time the sequel comes out. The release date for it is November 3rd. So... 9 days to beat the rest of the game... I don't know. I'm going to try. I'll probably get the new one at a later date. Below is what I have left to do. Mostly hard mode of some of the more advanced songs. 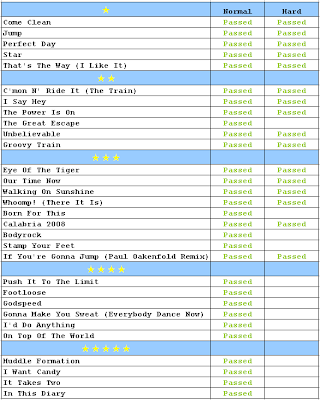 Today I unlocked the last 2 songs... Footloose is my new favorite song to do. You make me seriously want to to buy this.